The price of basic commodities, including bread and many other things, continues to go up despite spirited attempts by President Emmerson Mnangagwa's new administration to instil confidence in the economy. Soon after the fall of former president Robert Mugabe, the parallel market exchange rate for the US dollar went down considerably, giving hope of economic recovery after decades of hardships. But upon the announcement of Mnangagwa's cabinet recently, the US dollar firmed again against the Zimbabwean bond note and prices of basic commodities began to rise beyond the reach of many. The latest price hike is that of bread which went up by $0,10 as from yesterday. In a statement, one of the country's top bread makers, Bakers Inn announced the increase of a standard loaf from $0,90 to $1 while the family loaf rose from $1 to $1,10. "The price increase has been necessitated by the increase in the price of our major raw materials," read a notice signed off by Felix Vazhure, the general manger. The increase attracted condemnation from the Grain Millers Association of Zimbabwe (GMAZ) -- a body which represents suppliers of flour to bakers, which said the 10% increase was unjustified. "The grain milling industry is deeply shocked by the more than 10% increase in bread prices that consumers woke up to on Saturday December 16 2017. As the suppliers of the major raw material in bread baking, flour, we find the increase unreasonable and devoid of any economic justification," said GMAZ chairperson, Tafadzwa Musarara. He said three weeks ago, government set maximum wholesale and retail prices of maize meal, rice, salt and flour. "In that published list, bakers flour had (and still have) maximum price to bakers of US$32 per 50kg bag. The bakers did not object to this price because it is the same price that has been maintained by milling industry for the past five years. 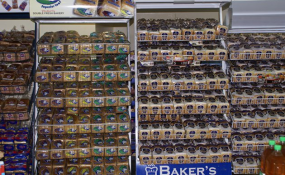 In fact, the three big bakers namely Bakers Inn, Proton and Labels who control more than 80% of the bread market, buy at much lower prices than US$32 per 50kg bag. Therefore, the increase cannot be attributed to any increase in the cost of flour because there isn't any increase of that sort," Musarara said. "GMAZ avers that consumers have been short-changed during this festive season where demand is at its highest. Accordingly, bakers have a duty to explain the increase to authorities and the consuming publics." The increases are taking place at a time when most companies are facing challenges in accessing hard currencies for the importation of key raw materials, with banks failing to settle their international payments in time. On the informal market, the US dollar is now trading at a premium of 40% to the bond note and 70% to electronic money transfers -- making it difficult for companies to import raw materials. Products whose prices have increased lately include milk and cooking oil. Officially opening the Zanu PF extra-ordinary congress on Friday, Mnangagwa appealed to retailers not to increase prices of basic goods and exposing the public. "We have urged our retailers to desist from wantonly hiking prices which I understand is happening. Let us have the people at heart and desist from profiteering," Mnangagwa said.